As it’s National Roasting Month in November, it’s ideal to know how to knock up a stunning gravy sauce to compliment your meal. Here’s a recipe you can use to create a tasty gravy that you can pour over your Sunday Roast Dinner, or even a Roasted Pepper dish you’re treating your friends and family to. 1. Quarter the onions and carrots and roughly chop the celery. Add these to a tray before you add your chicken for roasting. 2. Add the fresh thyme to the tray under the chicken and cook according to the instructions given for the meat. 3. Once finished cooking the chicken, allow it to rest for at least 20 minutes on a plate but cover it with tin foil. 4. While the meat is resting, collect the fat that has gathered in the tray and add a heaped tbs of plain flour to it. Place it over a medium heat and stir gently for up to 2 minutes. 5. Add Three Barrels brandy sauce and reduce the mixture by half. Then add the chicken stock. Bring this all to the boil and cook accordingly until the gravy mixture thickens. 6. Now add any other juices that have gathered from the chicken resting. 7. Season using salt and pepper. 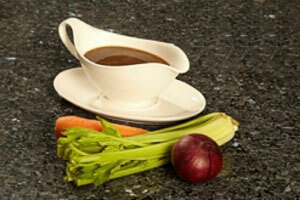 Use a sieve to gather any large particles in the gravy, and then serve with your roast dish.